the trade-offs in any system and get the optimal configuration according to your requirements and constraints. of a race car with front and rear parts of the body work parametrized, ready for the Mantium treatment. Systems with conflicting objectives will not reach a single- value optimum. 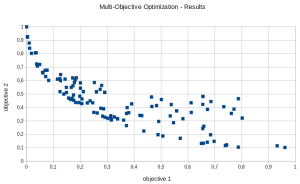 Instead, as showcased here, a pareto-front will emerge out of the optimization. This front helps to understand the trade-off between conflicting objectives. Staying with the race car example, two conflicting objectives could be lift and drag. Improving downforce will often create additional drag. Using the pareto-front, it is for example possible to find the configuration with the least amount of drag for a desired level of downforce. If you are interested in a project using a parametric optimization to drive your products to new horizons or have questions please contact us.